(Note: This list starts with Grands ready, Grands to be rebuilt, Uprights, Consoles, Spinets and finally pianos already sold . We can ship nation-wide using two carriers, one of which goes to a warehouse in your area or another delivers "door to door" (zip code determines pricing). Steinway Model B Grand, 7'. Serial number 98934; built in 1901. This is a great Steinway B; technically marvelous and musically quite exciting. A complete rebuild including a new soundboard, new Renner action, and new ivory keys. It has a new pinblock with German 2/0 pins and German wire. It is in an ebony satin finish with the original turned and carved legs and carved music desk. It has an assessed value of $48,000 however the price is negotiable. The piano is currently in the owner's home, about 25 miles northwest of Boston (near Concord, Massachusetts). Falcone Grand Piano, 7'4". Serial number 1015, made in 1984. Ebony polish finish. Genuine one piece ivory keys and ebony sharps. This piano was lightly used by the owner. The Falcone piano is a fine instrument, with the lucid tone of a Bösendorfer, and the responsiveness of a Steinway. Steinway Model L Grand, 5'10". Finish is ebony polish. Steinway Model B Grand, 7'. Made in 1911 Finish is Mahogany. Original board. Rebuilt and refinished (All Abel parts and hammers). Steinway Model B Grand, 7'. Made in 1900. Ebony finish. Rebuilt and refinished with new soundboard installed by "AcoustiCraft'' in Connecticut. New Renner hammers and shanks. Steinway Model D Grand, 9'. #147780 New Soundboard, pinblock and bridges. Restrung w/ German wire, new plate bronzing, New Steinway hammers, shanks and repetitions. Refinished ebony polished, hardware polished. Vose Baby Grand, 5'7". Finish is mahogany. Also from the 20ties, this piano sounds good now and a new pinblock in process. Piano is in progress. Sold. Behr Upright, 56". 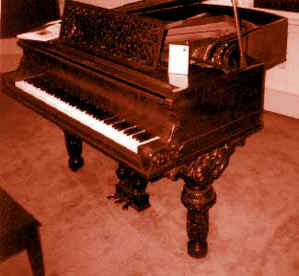 "Cherry picked" Victorian upright piano manufactured in 1901. Serial number is 16503. Case is African walnut. Refinished in walnut satin. New bass bridge, key tops, restrung, dampers. New key bushings and new Abel hammers, large sounding bass section. You must see the picture of this piano! This piano comes with a two year warranty. Asking $6,700. Sold. Evans Upright, 59". "Cherry picked" Victorian upright piano manufactured in 1890. Serial number 8091. Refinished. Recapped bass bridge and recapped treble bridge, restrung, new key bushings, Abel hammers and large sounding bass section. You must see the picture of this piano! This piano comes with a two year warranty. Asking $6,900. Pianos already sold and removed from inventory. Sold! Steinway Model M Grand, 5'7". Rare Original Condition Walnut Steinway Louis XV. Made in 1929, mint, excellent tone and touch, $26,500. Soundboard, bridges, wire, pinblock in mint condition. All original action and ivory keys. Very little wear on hammers or keys; never played. Belonged to a famous sculptor for its appearance. Finish pretty good with sun damage to long side. Comes with new artist bench. Repinned, regulated, voiced with excellent tone and touch. Action is not heavy. Tone is full and deep yet brilliant in the treble. It has the Steinway "magic". Accept "as is" or we will refinish and install German Copper bass strings to improve bass. We ship anywhere. Sold! Steinway Model D Grand, 9'. Made in 1976, this concert grand has been completely inspected for flaws and defects and none are in evidence. This fine performance piano was owned by a private party and located in a home residence. It was seldom played but much admired. The action has Teflon bushings. This action is fine as it is or you can choose to have us retrofit a new action with new Renner parts and action "weigh-off" from raw. (See data under "New Actions" on prior page). 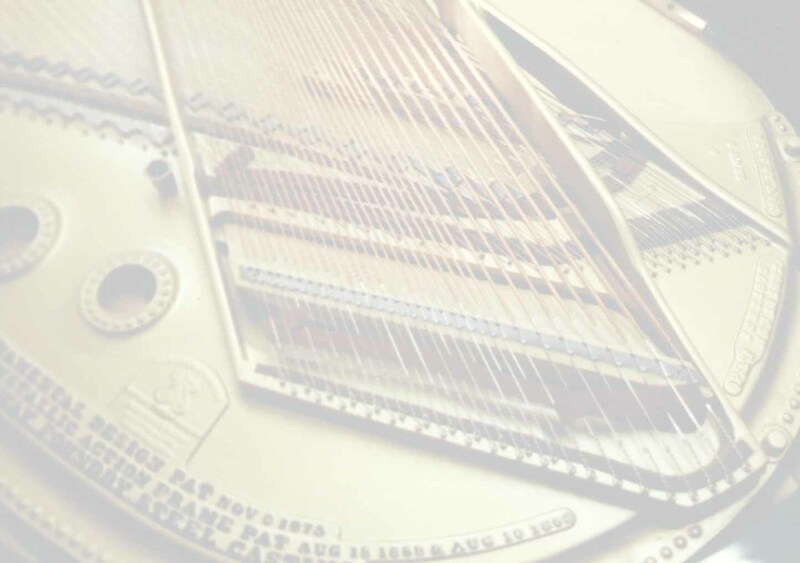 We can also install a complete new ivory keyboard and ivory sharps to match. SOLD! Mason A Grand piano, 5'8". Made in 1922. Serial # 30177 Just acquired. Refinished in mahogany and looks presentable but not pristine. Pinblock to be replaced and original soundboard repaired. Ribs are tight to the soundboard. It sounds good now and has good down bearing (good crown). It has plastic key tops which will probably be replaced with 2mm ivory. Original ebony sharps are in superb condition. Action is all original and the piano sounds very good now so how much restoration to the action depends on the potential buyer. Original hammers look good. SOLD! Steinway Model S Grand, 5'1". Serial #316447. Manufactured in 1944. This Steinway has TULIP LEGS and MAHOGANY INLAY. Finish is curly walnut and can be refinished in an color you desire. Soundboard is original. pinblock is tight and keys are ivory with ebony sharps. Bearing is good.